Take a trip back in time with the character that redefined video games in Sonic Mega Collection for the Nintendo GameCube. 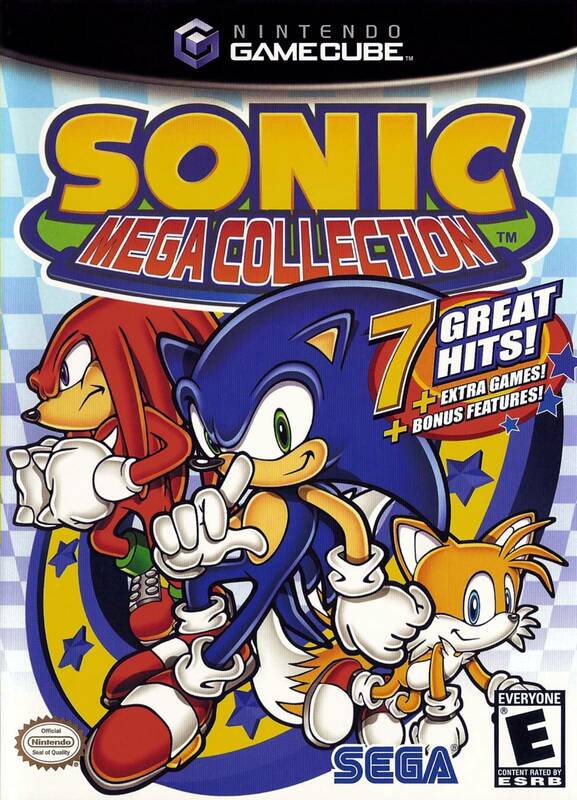 Sonic Mega Collection is packed with seven classic Sonic games, each presented in its original blistering-fast form. All the pin-point controls, upbeat music, and vibrant graphics return untouched. The compilation also contains unique museum elements housing the history of Sonic, including rare artwork, TV commercials, and exciting animations. With additional content such as character illustrations, movies, and comic-book covers, this game celebrates Sonic's long career and introduces his world to new generation of gamers. A game meant to expose the present to the past. If you were growing up in the early 2000s and owned a Nintendo GameCube (or other console for if you bought one of the other versions), you might have gotten this game along with Sonic Adventure 2: Battle. Other than that, there's not too much else to say about this game here. The game is a compilation of several notable Sega Genesis games with a focus on Sonic in particular. It has high-quality scans of manuals of the games included in the game, comic book covers, images of various Sonic characters with descriptions about them (including a soon to be appearing Cream the Rabbit, technically making this version of the game her first appearance) and more. But besides being able to play the games as advertised, there are hidden games able to be unlocked as well. To unlock them, all you have to do is "play" (entering the game and it registering that you entered the game) the games (certain games unlock other certain games) around twenty (for some) to thirty (for others) until it unlocks. Basically, if your missing a game just keep doing this until you have them all. Another thing that I find odd is that this is the only Sonic game for the Nintendo GameCube that doesn't have "Progressive Scan" support. Even Sonic Gems Collection has that support, and it's the same kind of game as this game. 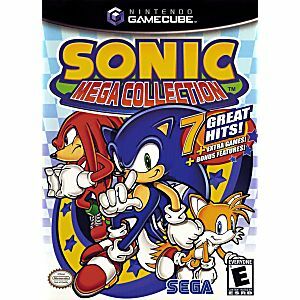 I suppose a thing that I kind of wish that this game also had was the ability to use save sates for these games, especially since I definitely know that Sonic Gems Collection had such a feature for its Game Gear games. The games are alright, but there are other games that have more of an appeal to me than most of the games here. Still, it's relatively affordable compared to buying the games listed alone. So unless you are having an issue with playing Sega Genesis games on more modern consoles, this wouldn't be a bad choice. Besides, all of the games play well, and you can change the configuration a bit if the initial configuration isn't suiting you. Could have slight improvements, but solid overall. Love the old days racing against each other to the finish line and playing the mean bean machine mini game. Game arrived early, complete package with instructions. No scratches on disc or ripped pages in manual. Sonic Mega Collection plays all the great Sonic Games from the Sega Genesis plus two bonus games to be unlocked. Along with some cool artwork and more this is a game collection that any gamer should have in their collection. I was not privileged as a child and did not have access to all the cool games like Sonic and Super Mario so I could only play when I went to a friends house. These games are just like I remember them and it's a lot of fun to be able to play them now. The game is in great condition and works perfectly. Got my order pretty quick too! Overall, I love this product! I must say that this Sonic game is a great compilation! It has all the good ones and the graphics are much sharper. I reccomend it to any Sonic lover! I spent my childhood playing Genesis and Sonic games are certainly the best of that generation. I loved this collection.